The all-new 2017 Wellcraft 262 Fisherman center console is proof: Wellcraft is not only back, they’re also building better boats. 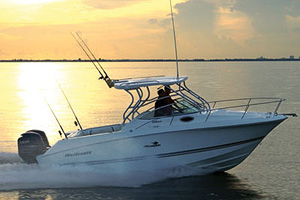 Few brands ever attain the status of Wellcraft, with its 60 year history of building recreational powerboats, but even fewer managed to exit the turbulence of the economic downturn with a slew of hot new models like the 221 Fisherman, the 241 Tournament Bay Boat, the 340 Coastal, and the 35 Scarab Offshore. 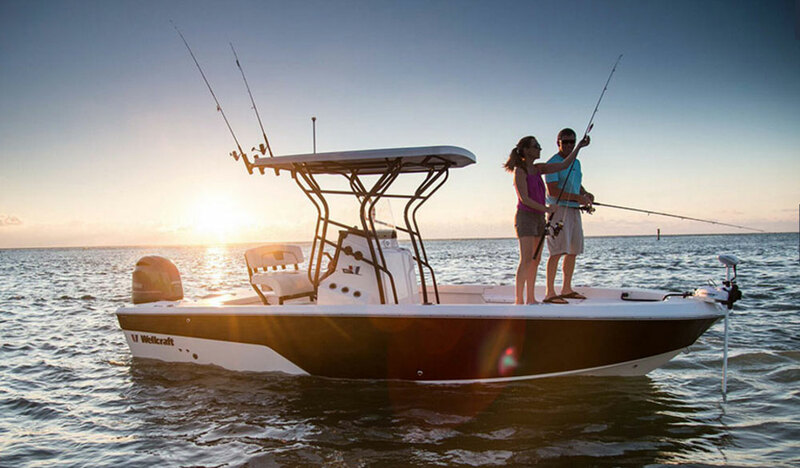 For 2017 Wellcraft continues the blitz of new models, hitting the water with the 262 Fisherman center console—and this model proves once and for all that Wellcraft’s future is just as bright as its past. But don’t take our word for it, see for yourself. The biggest take-away from our day on the water with the 262? Construction quality is exactly where it needs to be. As you saw, the pipework is thoroughly stout, and we saw similarly beefy construction touches in a number of areas. Hatches shut securely and solidly; there’s no flexing in any fiberglass part anywhere that we spotted; the windshield doesn’t flex like the thinner ones seen on some competitors; latches close and secure with a “clack”; and the hull cuts through waves with a solid ker-chunk. In fact, the one and only construction gripe we can split hairs on is the forward console seat track, which a binds a bit when you move the seat/cooler forward. Slid your hand down to the base when you push, however, and you probably won’t even notice. Gripe aside, we do want to note that the forward console seat/cooler arrangement on the whole is nothing short of brilliant boat design. And this is the real story behind the new Wellcrafts. Anyone can build a tough boat, but inventing features no other builders can offer is what really sets a manufacturer apart. On other center console fishing boats the forward console seat can’t be utilized for stowage, much less as a cooler, since it swings up with the rest of the entry door. But forward console entries are convenient, especially for tall or otherwise bulky anglers, because they make a much wider opening to move through. So usually a boat designer has to make a trade-off: stowage and cooler space, for ease of entry. 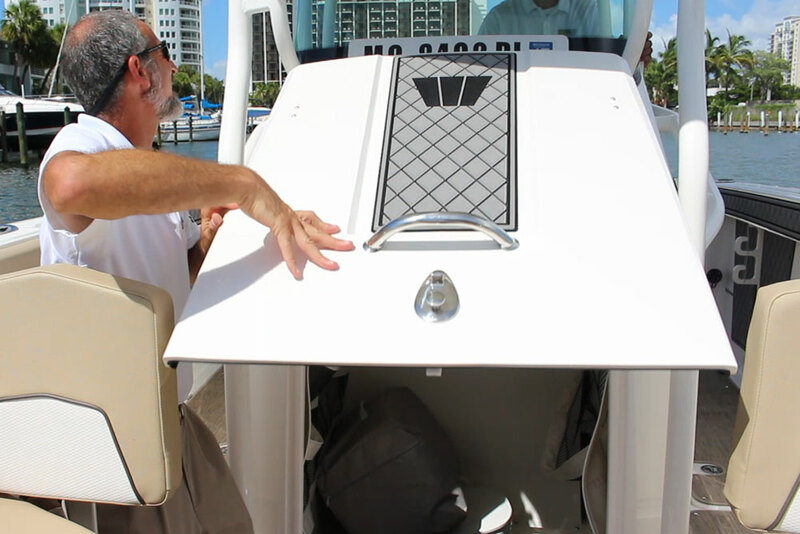 By splitting the seat/cooler from the console door and making it possible to slide the cooler out of the way, Wellcraft has reclaimed that usually-lost space and turned a trade-off into a win-win. Added bonus: with the seat/cooler all the way forward, the bow can be converted into a sunpad. Call it a win-win-win. 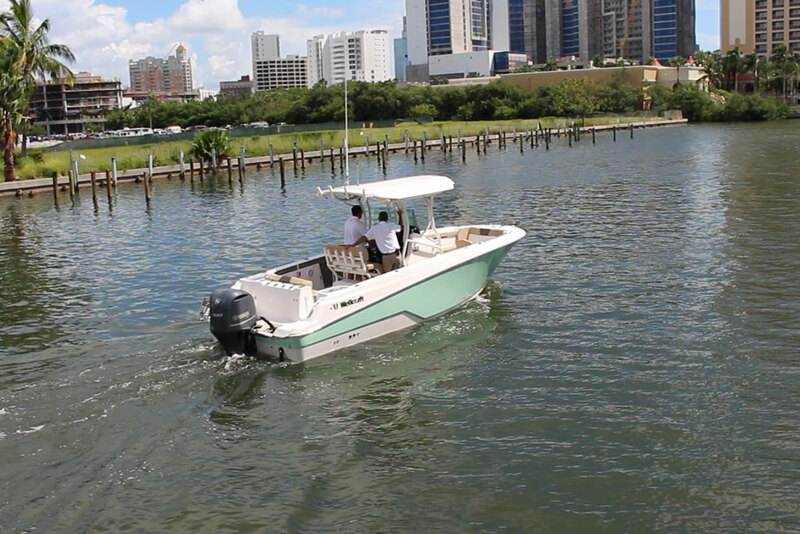 Smart design allows Wellcraft to reap the benefits of a front-entry center console, yet retain the forward cooler seat. There are also a number of nice details we found on our test boat, such as the snap-in “sea grass” style matt lining the sole, coaming bolsters all around the inwales, removable backrests for the forward bow seats, low-profile bow grab rails, and protecting pads around the under-gunwale rodracks, where reels sometimes bang against the fiberglass. All are smart touches, which come from years of experience building fishboats. What about that sink mounted inside the starboard-side livewell? As an angler, some will find it a hindrance rather than an asset. It’s likely to get in the way when you’re trying to net bait, and I can’t imagine that the constant saltwater bath is going to do the metal parts any favors. If this were my boat, I’d ask the dealer to remove the plumbing and plug the hole. Many viewers watching our video of this boat may question one other item that meets the eye: it’s powered by a single 300 HP Yamaha F300 V6 four-stroke outboard. 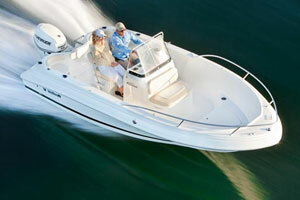 Wellcraft also offers this boat with twins up to a total of 500 HP. Most 26’ center consoles come with twins these days, and usually at a press event like the one where we tested the 262 Fisherman, the builder brings its prime grade-A offering to show off. So, why the single 300 on our test boat? First off, it gets you magnificent fuel economy for a boat in this class. Cruising just a tick below 30 MPH you’ll see 2.4 MPG. Most twin-screw center consoles in this class are going to be closer to 2.0 or 2.1 MPG, and a 15-percent fuel savings will add up fast. Secondly, the initial cost of the boat drops by as much as $25,000. Thirdly, maintenance costs and complexity drops. So while rigging a boat like this with a single may not be the most glamorous move, it does make one heck of a lot of sense. While the single engine rig we tested isn’t even close to max power, the advantages are numerous. Hold on there, partner, we know what you’re thinking: you don’t plan to spend your hard-earned cash on a new boat, just to be disappointed by its performance. Well, you can set those fears aside. 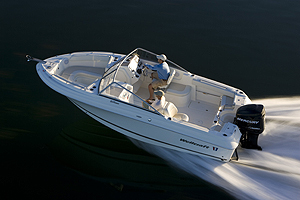 With the single F300 the 262 Fisherman cruises at around 30 MPH and tops out at 44.5 MPH. Those may not be eye-watering speeds by modern standards, but they’re more than enough to satisfy the vast majority of the anglers out there. When push comes to shove, in our opinion the 262 Fisherman is solid proof that today’s Wellcraft is living up to its storied name. 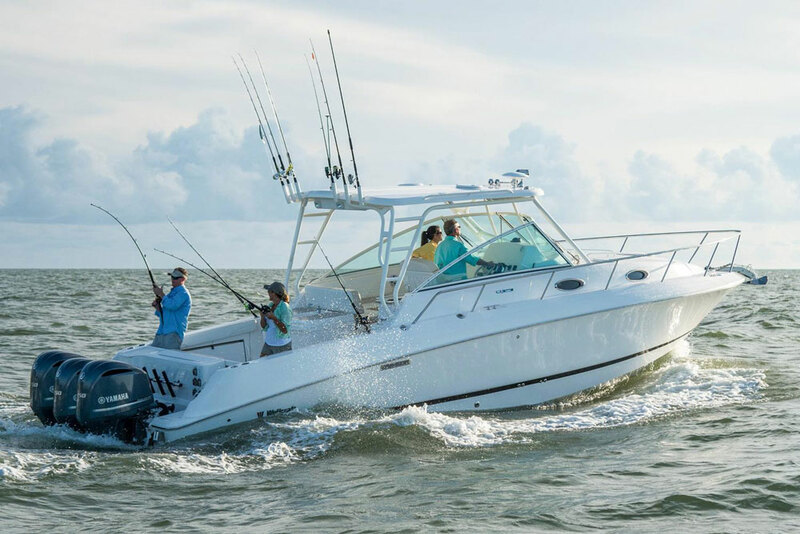 You can watch the video and you can read the review, but if you’re shopping for a boat of this nature we suggest you also check out these Wellcraft 262 Fisherman listings, visit the closest dealer, and take one for a sea trial. There’s no better way to prove to yourself that Wellcraft is back—and is better than ever. 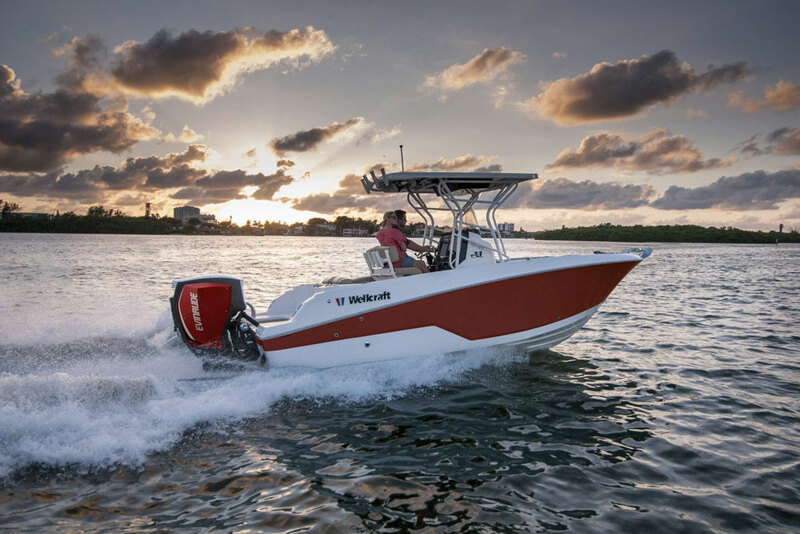 Other Choices: Competitors would include boats like the Cobia 277, which is a hair longer but weighs slightly less than the Wellcraft and hits 50 MPH with twin 200’s. 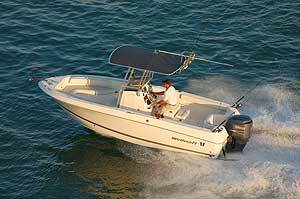 Another option would be the Striper 270, which offers similar performance. 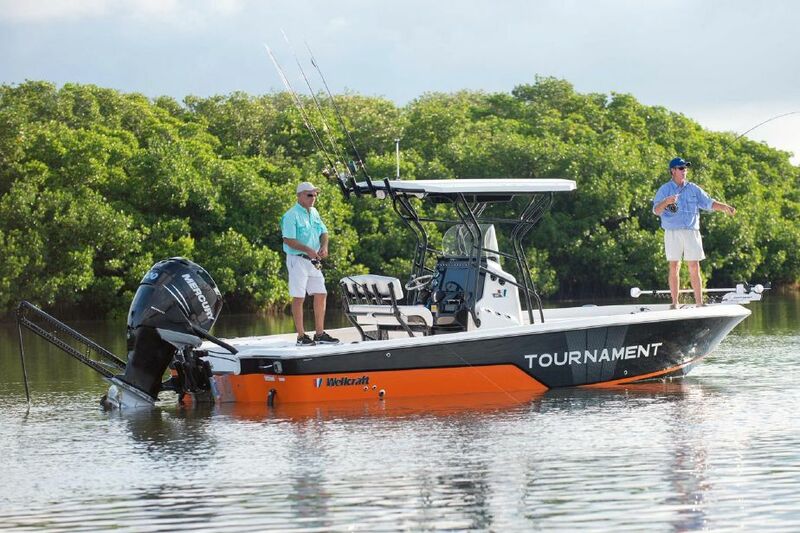 If you’re willing to give up some of the creature comforts these boats offer in favor of a more die-hard fishing attitude, you may want to check out the Regulator 25. For more information, visit Wellcraft. Test conditions: Winds of 10 to 15 knots, two POB, full fuel. Performance data courtesy of Yamaha. Power Single Yamaha F300 four-stroke outboard, swinging a three-blade 15 ¾” x 15” stainless-steel propeller.